L ast weekend was Halloween! One of my favorite holidays like I mentioned in my last blog post. I had been talking with my sister-in-law about wanting to throw a halloween party and we decided that this year we were going to do it! So after weeks of planning and waiting for the party day to arrive, we had a successful halloween & pumpkin carving party! 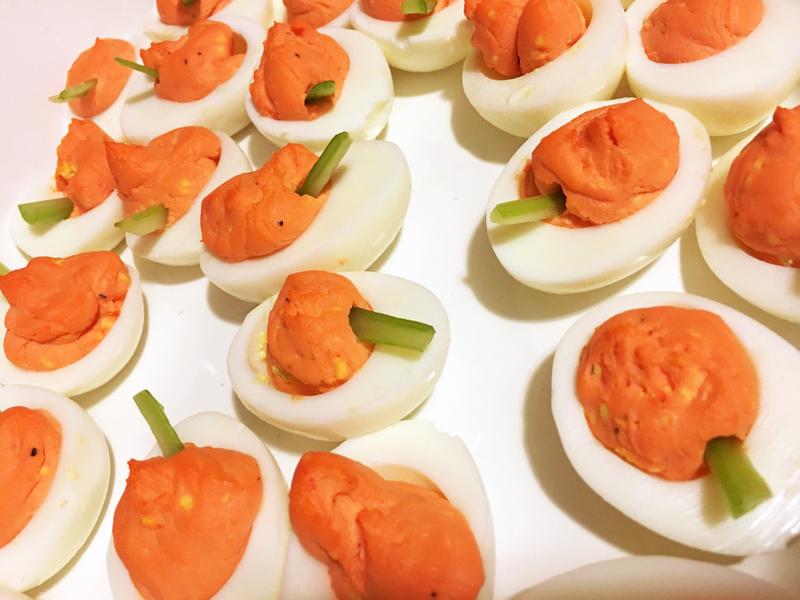 I wanted to share a few of the food items that I made for the party! They were really fun to make and really easy. Prepare them like normal, hard boil the eggs, let them cool a little, de-shell them and cut them in half. Take the yolks out and place in a bowl. Mix with a little mayonnaise, ground mustard, hint of ground pepper and orange food coloring. Put into a piping bag (can use a zip lock bag, just cut the corner off to make a piping bag) and fill the center of the eggs. Next, chop up some celery and place halfway into the filling to make the “stalk” of the pumpkin. Finely crush up Oreos in blender or food processor. Mix Oreos in a bowl with softened cream cheese until well blended. Form 2 inch balls (can be smaller if you wish) with the mixture & set on wax paper lined cookie sheet. Stick lollipop sticks/paper straws in Oreo balls. Set in freezer for at least 1 hour. Print off your stencil & cover with wax paper. 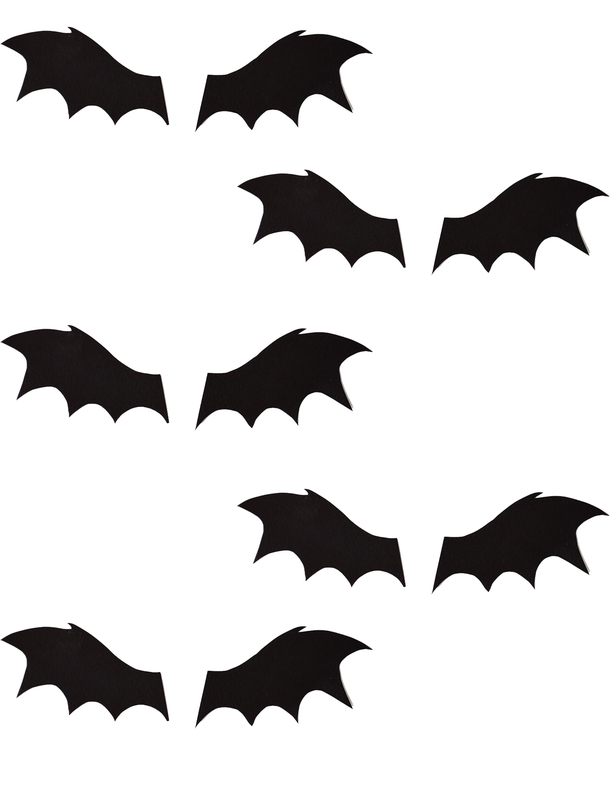 Start tracing the bat wings with the chocolate. Trace twice as many as you have balls and place in the fridge when done. When the balls are cool enough, start melting the chocolate down. I used a chocolate that I found that comes in a microwave safe container and melts down in 60-90 seconds. While the balls are still wet add the eyeballs to the bats & the bat wings one at a time. If you need to, coat the end of the batwing in chocolate and stick to the ball. Optional: you can add tiny chocolate chips to the top of the balls to make little horns/ears. Freeze/Refrigerate the Oreos for a half hour. Dip the pops into the white chocolate giving it a good coat. Wait until they are completely dry & start adding wrapping. In a piping bag (or zip lock – as you can see I love using this option due to the easy cleanup factor!) place the melted white chocolate and start drizzling over the pops going back and forth to make it look like a mummy who’s all wrapped up. I hope you enjoyed this blog post! Leave me a comment below if you have any questions or want see something specific! 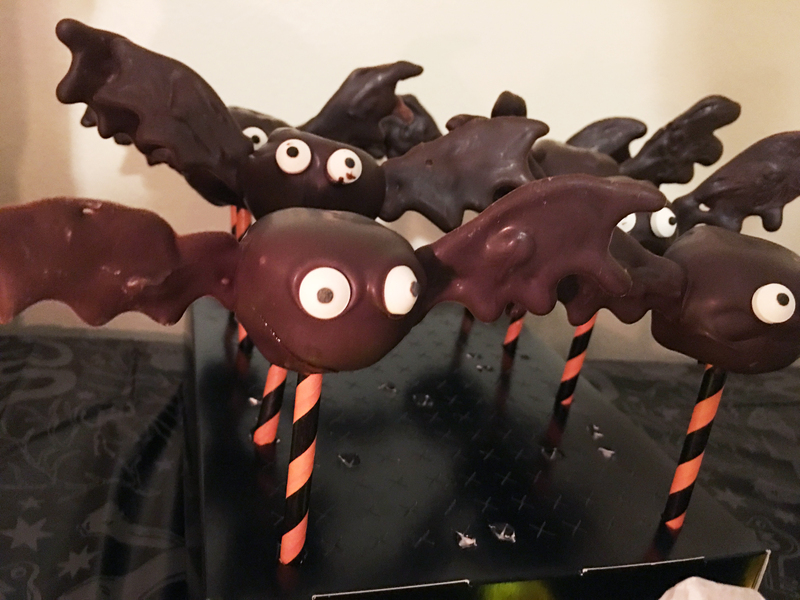 Oreo bats and Mummy pops looks phenomenal and yummy!! Great job Cari!